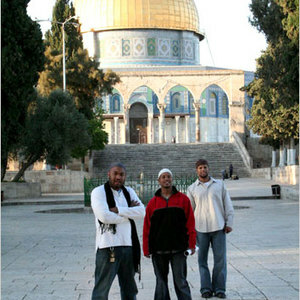 Native Deen is a hip-hop trio band of Muslim musicians. It consists of three young Muslim men who were born and raised in America. Joshua Salaam, Naeem Muhammad, and Abdul-Malik Ahmad who grew up in Washington, DC. Their music seeks to inspire young people to keep their faith amid the pressures and temptations of modern life. "Deen" in Arabic means religion or way of life. The group identifies themselves as Muslim, and wear traditional Islamic dress such as kufis and shalwar kameez. Of course, they say there is more than one way to identify as a Muslim, both by etiquette and dress. "Deen" in Arabic means religion or way of life. The group identifies themselves as Muslim, and wear traditional Islamic dress such as kufis and shalwar kameez. Of course, they say there is more than one way to identify as a Muslim, both by etiquette and dress. Their music is hip-hop style, with lyrics on Islam and several of their songs focus on living as a Muslim in America amidst pressures and temptations. All of their music is positive, tolerant, and generally upbeat. As Native Deen, they perform at Islamic conferences, fundraisers, weddings, and holiday gatherings (usually in Ramadan and Eid-ul-Adha). They are relatively well known among the North American Muslim youth, and have toured internationally. Native Deen came about through M.Y.N.A. or Muslim Youth of North America. The project was a gathering of amateur recording artists who've written their own work and MYNA featured these artists on the MYNA RAPs' album. Three of the artists from these albums, Joshua Salaam, Abdul Mailk Ahmad, and Naeem Muhammad, who were all solo, started a group where they could do this professionally, and the result was Native Deen. Their music is produced under the Mountain of Light label, which was founded by Yusuf Islam (previously known as Cat Stevens).